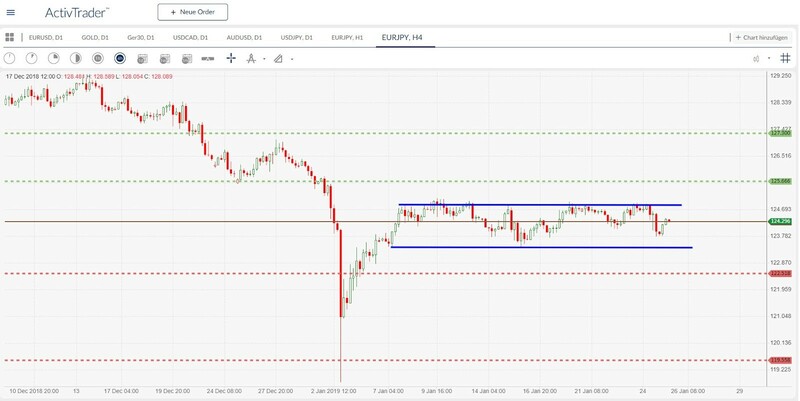 EURJPY: Sideways – A Chance at the Breakout? The EURJPY has been moving sideways for quite some time now. The range on the 4-hour chart is limited to the upside by the 124.80 range and the lower range by the 123.40 range. The market has tested the upper border several times. The lower limit has been tested once so far, by a reset. The 50 % retracement of the previous bearish movement, at the smooth 124.00, runs through the midline of the sideways action. Neither the MACD indicator nor the RSI show clear signals. This is typical for a sideways movement. With a sustained breakout to the upside, the first possible target is relatively close to the breakout level and lies at 125.65. If the bulls push through and overcome this obstacle without any effort, then the next potential price target is at 127.30. If, however, the bears take over the market, then the first potential price target is down at 122.50. If the market does not find a hold at this point, there is a possibility that a more extended downward movement will take place. Potential support can be found in the market at 119.50. In summary, EURJPY has been trading in a narrow range on the 4-hour chart. Only a breakout from this sideways movement can provide these signals.